When you know it's time to begin looking for a new home, the choices available on the market can easily overwhelm you. With so many factors to consider, it can become really difficult to find exactly the right home for your needs, desires, and budget. Most people think the word "home" automatically means a single-family freestanding house, but that's only one of the many options you have. Let's make finding your perfect new home match easier! Below, you'll find details on seven popular new home types for you to consider during your search. The yards, building exteriors, and streets are jointly owned and jointly maintained by a community association. Legally speaking, a condominium is any piece of property that you own the interior of your unit but the land on which it sits is either owned by someone else or is a common space. In Canada, most "condos" exist in established communities and residents are often charged monthly fees that go towards maintaining the common areas such as parking lots, elevators, hallways, entrances, landscaping and recreational facilities. Generally, condominium owners are part of a corporation or board that has leadership, bylaws, and regular meetings to address issues relating to the properties and/or residents. A new condo can be your best home option if you want to live a maintenance-free lifestyle in a premium location. Make sure to look into how the parking works for each condo unit you look at. Some buildings have underground parking, some have an open lot, and in some cases, you may need to park on the street. If you plan on having a lot of company, ensure you find out what the rules are for visitor parking as well. Condos are a great choice for first-time home buyers, particularly young working professionals who don't want to worry about shovelling walks or mowing the lawn. They're also excellent for older couples who don't need all that space in their current house now that their kids have moved out of the house. The money they can save by downsizing makes buying a condo a very appealing option. A townhome are individual units connected in a row, where you share at least one wall with your neighbour. 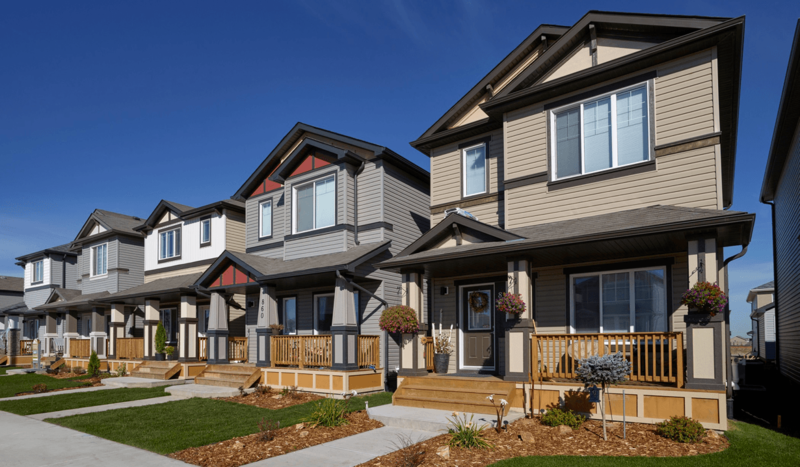 The land a townhome is built on is solely owned by the homeowner, meaning the maintenance of the exterior of the home as well as the lot is the homeowner's responsibility. The townhomes built in our communities either have a rear detached garage or drive-under garage. They are great starter homes because of their affordable price tag and comparable square footage found in some single-family homes. Young families and couples are drawn to townhomes, where they can start enjoying the benefits of homeownership. Another good fit for this style of home is the downsizer. With the conveniences of condo living and the benefits of more space, it's a great fit for these home buyers. This term refers to housing units attached to each other with a common wall between them. (unlike townhomes which usually have neighbours on both sides). But you'll own the home as well as the land it's on. You'll be responsible for all the maintenance, repairs, utility bills, property taxes, and any community association fees for the property. Most duplexes in our communities come with a front attached garage, so you won't have to worry about where to park, and you'll even have some driveway left for a second vehicle if needed. Much like with townhomes, a duplex can be a more affordable option as a 'larger' first-time home purchase. They are also good if you want to downsize, but still want to feel like you're living in a single family home. A laned home is a freestanding single-family home, usually with a rear detached garage, which is located at the back of the home and accessible by an alley or lane. This style of home provides more curb appeal by not having the garage dominate the front of the house. You will be responsible for all maintenance, repairs, utility bills, property taxes, and any possible community association fees. Families can't go wrong with this home style, especially if they enjoy spending time outside. You can easily keep an eye on your kids while they run around the backyard, or step out onto the front porch at night and enjoy a beautiful summer sunset. Additionally, with the garage in the rear of your home, you could use the space as a studio or workshop and keep it separate from your main living space. This is the classic definition of a home, a freestanding building with a front attached garage you own along with the surrounding property. 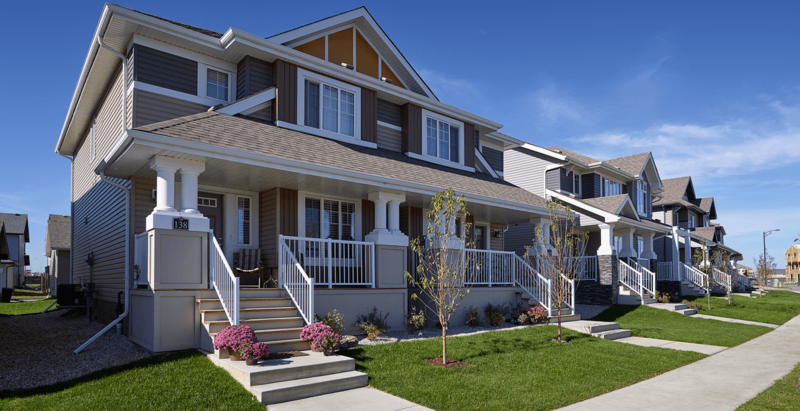 Just like townhomes and duplexes, you'll be responsible for all maintenance, repairs, utility bills, property taxes, and any possible community association fees. 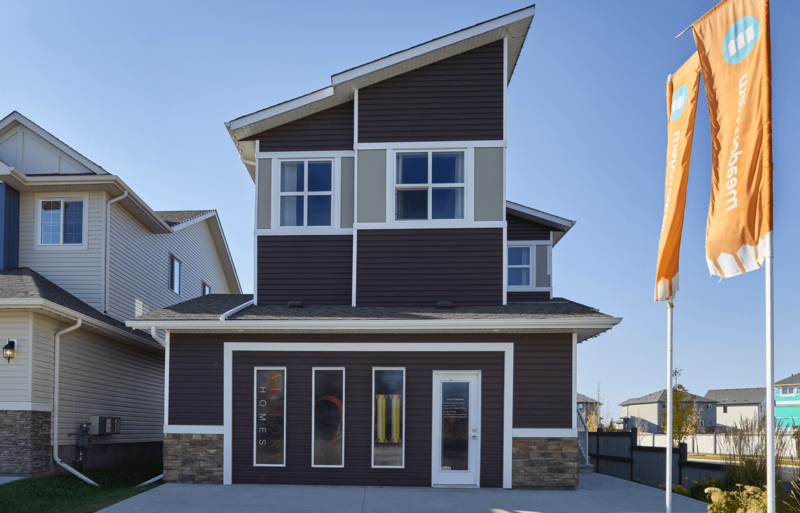 This home style is perfect for busy families, who will love the adding convenience of not having to go outside to get in the car during Edmonton's cold winters. You can drive right into your warm home and bring the groceries into the kitchen with ease. It's much more convenient with the garage attached to the front of the home and it usually means more space in the backyard for you and your family to enjoy. Having trouble choosing between having a front attached garage or a beautiful porch to enjoy? 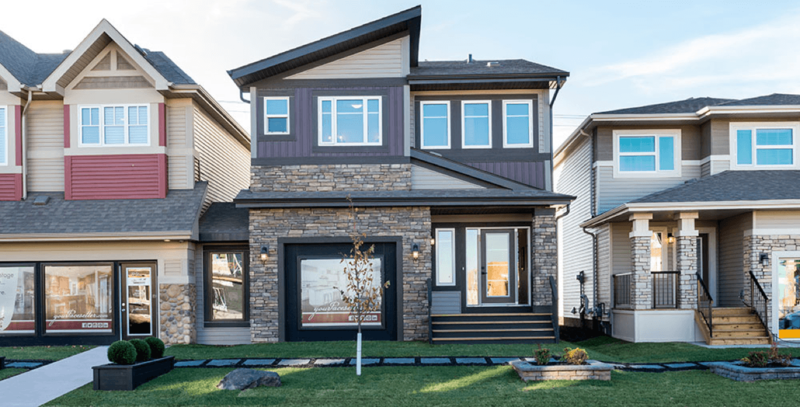 The unique Streetscape homes are exclusive to two communities in Edmonton – The Uplands at Riverview and Langdale in Windermere and they solve this dilemma for you! They feature a recessed garage with a front porch which increases the curb appeal and character of the home. So while technically, this style would fall under the single-family front attached garage category, the uniqueness of the design put it into a class of its own. Families love this home style for its creative look, which you won't find anywhere else. Executive style homes (sometimes referred to as custom homes) are built on wider lots than an attached garage home, which in turn makes the square footage of the home larger. These homes showcase custom details, and premium fixtures and finishes. Are you looking to build the dream home you've always wanted? Building an Executive style home will allow you to construct your new home to a level of detail that will be difficult to find elsewhere. You can look at a 3-car garage, add a wine cellar, put in a movie theatre room - the possibilities are endless! Just remember that with a custom home comes a custom home price. These types of houses are at the high-end of the housing market, and for good reason. Determining which kind of house will be right for you depends on a number of factors, including your budget, preferences, and availability. Before shopping around for your next home, spend some time to determine what type of house is the right match for you. Originally posted October 6, 2017, updated February 8, 2019.